Forest Steven Whitaker, actor, producer, and director, was born in Longview, Texas, July 15, 1961, but was raised in South Central Los Angeles, where his parents moved when he was four years old. His father, Forest Whitaker, Jr., was an insurance salesman, and his mother, Laura Francis Smith, was a special education teacher. Whitaker was the second of four children, having one older sister and two younger brothers. Whitaker commuted to Palisades High School, twenty miles away on the west side of Los Angeles, where he developed his love for singing and acting in musicals and plays. He was also an all-league defensive tackle on the school’s football team and received a football scholarship to California State Polytechnic University, Pomona, where he enrolled following his graduation in 1979. When a back injury ended his future as a football player, he changed his major to voice and soon transferred to the University of Southern California (USC) where he studied opera and enrolled in the University Drama Conservatory. He graduated from USC in 1982. Whitaker’s break into show business came when an agent saw him singing in a production of The Beggar’s Opera while in the USC conservatory program. Whitaker is now one of the most sought-after and well-respected actors in Hollywood, having sixty-one major motion pictures to his acting credit, along with four films which he directed and produced. He is best-known as "Idi Amin" in The Last King of Scotland (2006), a role that earned him an Oscar in 2007. His preparation for that role included learning Swahili, learning to play the accordion, and interviewing Amin’s former generals and relatives in Uganda. For his efforts he received seventeen awards including an Academy Award for Best Actor, a Golden Globe Award for Best Actor, and the NAACP Image Award for Outstanding Actor in a Motion Picture. Other important film roles include Fast Times at Ridgemont High (1982), The Color of Money (1986), Platoon (1986), Good Morning, Vietnam (1987), The Crying Game (1992), Body Snatchers (1993), Phone Booth (2002) and most recently in Repo Men (2010). He played the title role as Charlie "Bird" Parker in the 1988 film, Bird. His television credits are equally impressive with twenty-three roles including The Twilight Zone as Host/Narrator for 44 episodes between 2002 and 2003, ER in six episodes between 2006 and 2007 and in the series The Shield between 2006 and 2007. 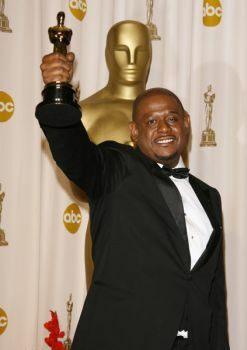 Forest Whitaker lives in Los Angeles and continues to be active in the film and television industry. Caitlin A. Johnson, “Forest Whitaker: The King Of The Oscars?," CBS News, February 4, 2007; Mike Sager, "What I've Learned: Forest Whitaker," Esquire, February 26, 2007; Adam Sternbergh, "Out of the Woods: How Forest Whitaker Escaped his Career Slump." New York Magazine, January 9, 2006.